Scientists call these small quakes “episodic tremor and slip”, or ETS. As the name implies these episodes of tremor occur frequently, about every 12-15 months along the Vancouver Island/Olympic Peninsula region. By the completion of each episode, the ground has slipped about 2.5 cm (1″) over the Pacific plate that is diving beneath the North American plate. Episodic tremor and slip was only recently discovered in 2002 along the Japanese subduction zone, and shortly after scientists looked for, and found, evidence of similar motions in the northwest coast seismic record. Tremors are very small and slow compared to more normal earthquakes like the Nisqually earthquake back in 2001 that struck south of Seattle. Seismogram comparison of a typical large earthquake, the M6.8 2001 Nisqually earthquake, and a typical pattern for tremor, or slow earthquake. Note the different scales on the x-axis and the amplitudes (y-axis) are scaled to show similarities. (Source: PNSN). As you can see in the seismogram, the duration of the slow earthquake, or tremor is many times longer than the Nisqually quake and the waveforms are rather distinctive from each other. The slow earthquake lacks distinct peaks that would indicate the arrival of seismic waves. Additionally, the amplitude of motion for the tremors is much smaller than a typical big earthquake, like Nisqually, so that is why they are not felt. Geologically, what is happening? Episodic tremor and slip is occurring at the boundary between the North American Plate and the subducting Juan de Fuca Plate. Along this boundary, it is now thought that there is a locked zone, where the two plates first meet and where the plates are cold and brittle. This is a shallow (<20 km deep) zone that generates the massive mega-thrust earthquakes like the 2011 Tohoku earthquake that caused the devestating tsunami. To the east of that zone is the episodic tremor and slip zone where it is thought that perhaps fluids play a role in occasionally lubricating the boundary between the two plates. This ETS zone is at a medium depth of 25-40 km beneath the surface. 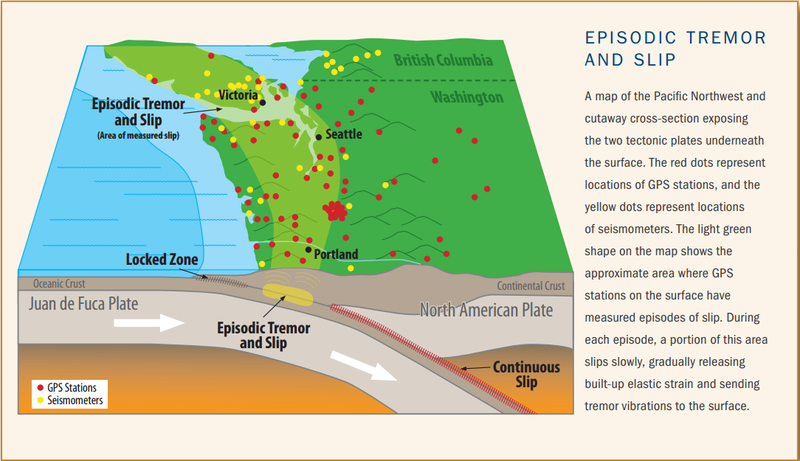 Eastward, and deeper, than the ETS zone is a zone of continuous slip where the subducting Juan de Fuca plate is warm enough to deform plastically and slides smoothly beneath the North American Plate down into the asthenosphere. So, you may be asking, did the tremor cause the December 29th earthquake? Unfortunately, it is too early to say with certainty, however, we do know that the location of the earthquake on the 29th was on the southeastern edge of the tremor. That said, the depth of the earthquake was 52.5 km beneath the surface, putting it over 10 km deeper than the ongoing tremor and likely within the subducting slab of Juan de Fuca Plate. The two events may still be related, though, as the tremors may have changed the strain within the rock and possibly triggering the Victoria quake. Slow tectonic slip continues to be an area of active research around the world. Just this week, Japanese researchers published results suggesting a link between slow slip events and large (>M5) earthquakes on the Japanese subduction zone. Since slow slip events are episodic on that subduction zone as well, detection of these slight movements may help the country prepare resources in the event of a larger quake. The same link between sudden and slow earthquakes has not yet been found on the Northwest subduction zone, but new discoveries are made all the time in this young area of research. To get a sense of the frequency and progression of these events along the coast, here is a fascinating video of all the tremor recorded between Vancouver Island and Northern California between 2012 and 2016.